We are often asked about the differences between the Ernesto and the DockStar, after all, they are quite similar guitars in many ways. 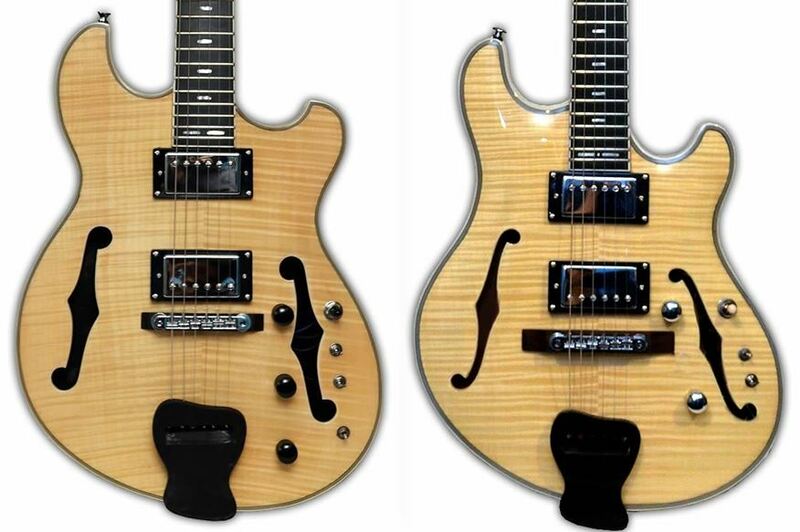 Both guitars are hollow body guitars, and are inspired by the amplified tone of Trey Anastasio's Languedoc guitars. The Ernesto and DockStar are not exact Languedoc copy, or Languedoc replica guitars, as there are differences in shape, construction, inlays, materials, etc. that make our Ernesto and DockStar different than Trey's guitars. 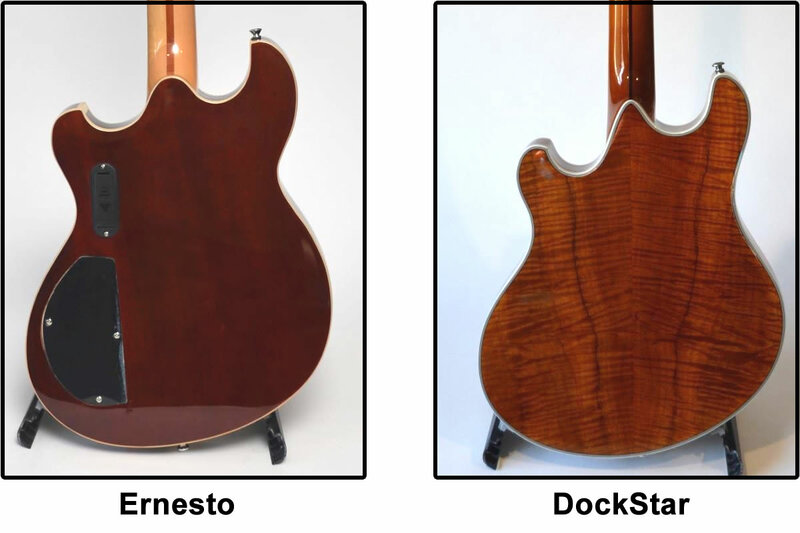 With this in mind, let's look at the main differences and similarities between our Ernesto and DockStar guitars. 1. Both guitars have a mahogany core body, maple neck, and ebony fingerboard. Both guitars are hollow body guitars and are constructed by routing out a solid piece of wood as pictured below. A top piece of wood is then glued on top of the body, and then a wood veneer sheet is pressed on top. 2. Both guitars have an ebony tailpiece and floating bridge. The floating bridge literally floats on top of the guitar body, such that when you change strings, the bridge will move. For this reason, we recommend to tape down the bridge with masking tape when changing strings, or plan to re-position and re-intonate the guitar. If you do have to reposition the bridge after changing strings, note that the scale length from the nut to the bridge on both guitars is 25.5", similar to a Fender Strat guitar. 3. Both guitars have 2 humbuckers, a 3-way pickup toggle, and split coil mini-toggles. The split coil mini toggles can be re-purposed for split-coil and series/parallel when upgrading to the USA rewire option. OK. 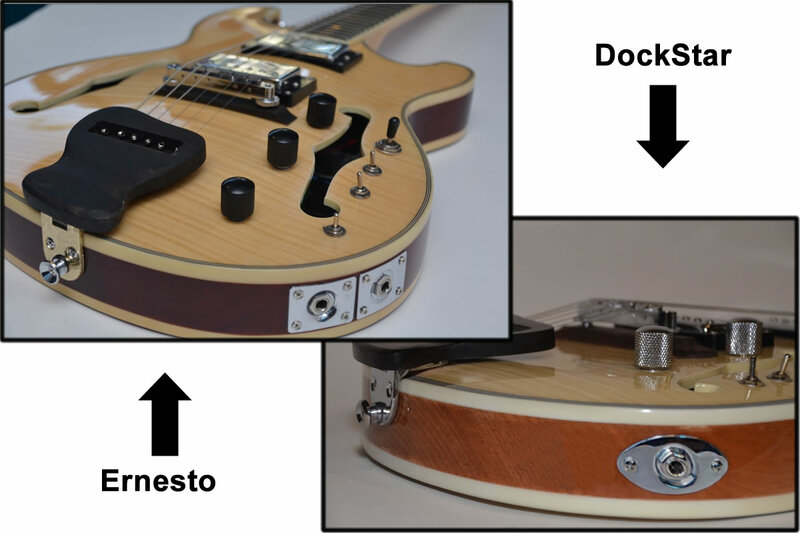 So those 3 things are the basic similarities between the DockStar and Ernesto guitars. Let's look at the major differences between them. 1. The DockStar has a rear side veneer sheet in addition to full binding on the back side, as pictured below. The Ernesto has side binding on the rear side, and the grain of the mahogany body is visible on the rear side as opposed to being covered with a wood veneer. 2. The Ernesto has a built-in preamp. In the picture above, you can see a 9V battery box on the left side on the back of the Ernesto guitar. This 9V battery powers the built-in pre-amp. The pre-amp is powered on when you plug in a guitar cable. The purpose of the pre-amp is to improve the quality of the signal from the pickups by changing the impedance from high to low. This pre-amp helps to preserve the signal from the pickups along the guitar cable and through your effects chain, and also increases the high frequency clarity, and overall clarity of the amplified tone. The 9V battery can last up to 2 weeks if you were to keep the guitar plugged in 24/7. 3. The Ernesto has discrete tone knobs, one for each pickup, as pictured below. Both guitars have a main volume knob. 4. As pictured above, the Ernesto has two outputs, while the DockStar has one output. The second output on the Ernesto is used for the built-in On Board Effects Loop, often referred to as an OBEL (pronounced Oh-Bull or Oh-Bell). The OBEL, as developed by Jerry Garcia for his guitars, is a wiring setup inside the guitar that works similarly to a SEND and a RETURN on a guitar amp. The OBEL allows for a full guitar signal to exit the guitar, go to your effects, and then back in to the guitar for post-effects volume adjustments. You'll also notice that the Ernesto has a 3rd mini-toggle which is used to bypass the OBEL and play the Ernesto as you would a standard electric guitar with effects in-line with the signal to your guitar amp. You can read more about the OBEL on our OBEL Spotlight page. 5. 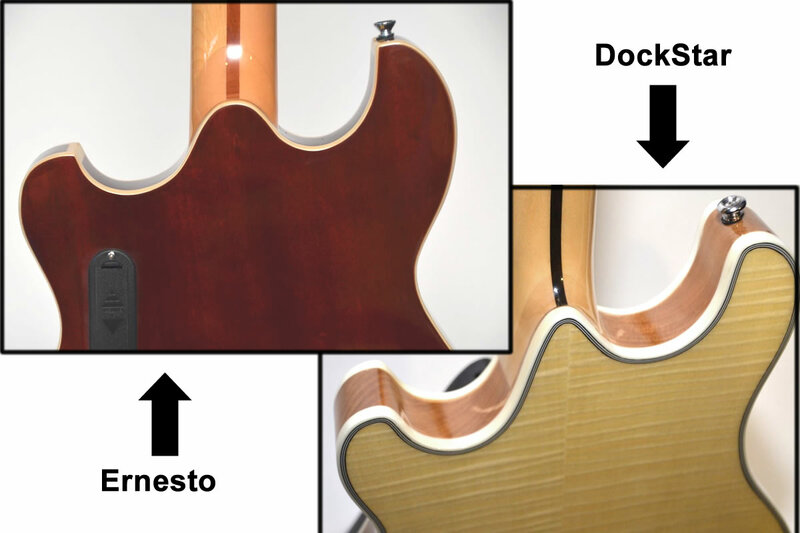 On the back of the neck, up near the headstock, the Ernesto neck has a scarf joint while the DockStar neck as a volute (see image below). A scarf joint is sometimes not visible, especially if the guitar neck is painted, and consists of two pieces of wood glued to each other on an angled cross-section. A volute is visible as it sticks out from the neck, just below the nut so it's not in the way of playing. 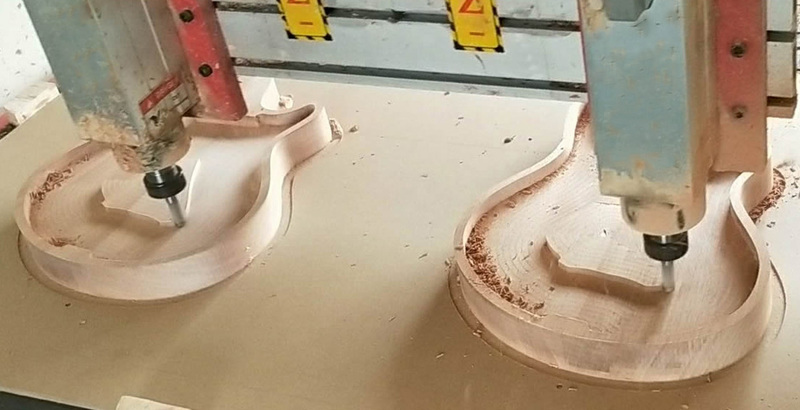 Scarf joints and volutes are used in guitar building to strengthen the guitar neck at the point where the headstick tilts back from the neck, in order to support the tension and pull created by the strings. 6. 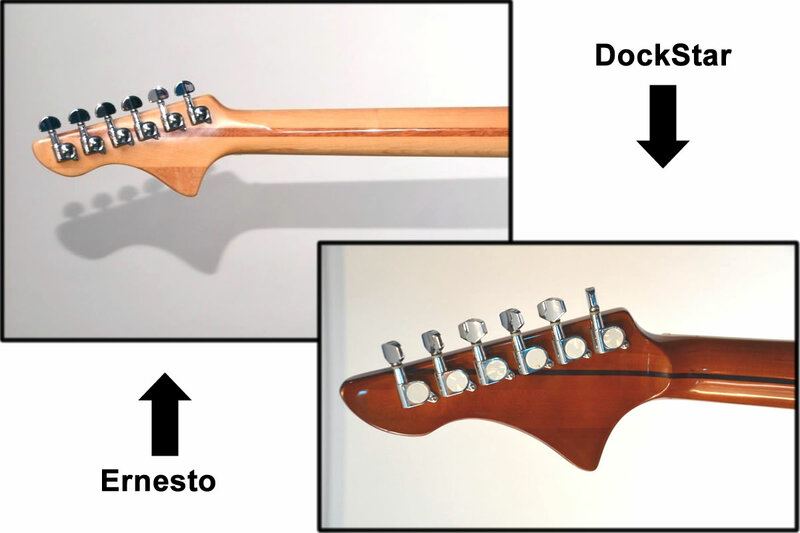 Another difference between the Ernesto and the DockStar is how the strings are electrically grounded. On an electric guitar, it's important to make sure the strings are electrically grounded to the electronics. Usually, this is done by soldering a wire from the underside of the bridge to a grounded location on the electronics. Since both guitars have floating bridge platforms made of wood, grounding the strings is done a little bit differently, and different on each of these guitars. On a DockStar, the strings are grounded through the tailpiece. There is a metal piece inside the tailpiece that the strings touch, and this metal plate is grounded to the inside wiring on the DockStar. On the Ernesto, there is a metal post that sticks out below the wood bridge, and there is a small hole on top of the Ernesto Body where the metal bridge post touches a groud wire. Another difference here, is also that the bridge on the Ernesto gutiar is anchored to the body because of how the strings are grounded. 7. The last major difference between the Ernesto and the DockStar is that the Ernesto has a rear access electronics panel, while the DockStar does not. This makes it easy to access the electronics in the Ernesto, and a bit more challenging to do so in a DockStar. The main reason the Ernesto has a rear access panel is because the wiring is a bit more complex as a result of the pre-amp and the OBEL. See photo below.